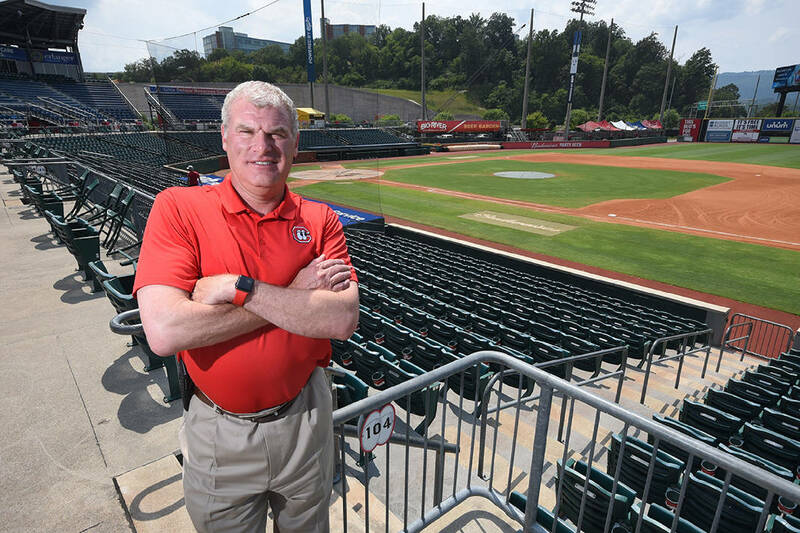 One of the Chattanooga Lookouts' general partners says he sees this fall as a key time in talks that could lead to a new multi-use stadium and that the team will have "a lot of skin in the game." Businessman John Woods also said that while Chattanooga has seen a lot of growth, it needs to "think bigger." "We already have a nice city that will be better," he said, with the stadium project helping spur new development in the South Broad District. "We've got to go further." In a recent interview, Woods said the team's preference is for a public-private partnership to finance the stadium project, though he didn't get specific about funding. "Later this year, we'll sit down with the parties," Woods said. He said a so-called master developer of the 141-acre foundry tract off South Broad Street, which a recent study identified as the site for a new stadium and other development, should be on board by fall. "Then, we'll sit down and put pen to paper to figure out the economics," Woods said. "Whatever is decided will be a fiscally responsible deal that's great for the city." At the same time, some are urging caution moving forward. Kim White, who heads the downtown nonprofit redevelopment group River City Co., said her entity is "neutral" in terms of a new ballpark. "We need to be careful as a city," she said. White said Chattanooga has downtown, the almost vacant Alstom property near the central city and the former U.S. Pipe/Wheland Foundry land. "There isn't enough bandwidth to put energy in all three," said the CEO of River City, which holds the ground lease to the Lookouts' AT&T Field downtown. Helen Burns Sharp, founder of the citizens watchdog group Accountability for Taxpayer Money, said if taxpayers are asked to enter into a public-private partnership for a stadium, she hopes the city and Hamilton County mayors insist the public "get a fair shake if they choose to negotiate." "Too often in Chattanooga and Hamilton County, agreements have been one-sided in favor of development interests," she said. "No one seems to have been at the negotiating table representing taxpayers." Sharp said if a payment-in-lieu-of-tax (PILOT) agreement or tax-increment financing (TIF) is used, there needs to be "meaningful clawback language" to make sure the company meets its commitments. "ATM recommends that we do what Knoxville does with TIF applications by requiring an impartial cost-benefit analysis by public financing experts," she said. Woods, who lives in Atlanta but was reared in Chattanooga and plans to move back within a couple of years to oversee business interests here, said "anything is on the table." "The last thing we want to do is strap the city with a bad investment," said Woods, who bought the team about four years ago. He said the city will come out "a lot further ahead" financially with a modern, multi-use entertainment venue than the current ballpark. Woods said a new stadium will help generate higher sales and property taxes. New minor league stadiums in other cities show there's a model for what such venues can do to spur growth, Woods said. "This isn't a conceptual idea," he said, citing what has been done in places including Fort Wayne, Ind., and Columbia, South Carolina. "There's a lot of smart money around here that wants a stadium." Woods said the stadium and surrounding development will create a new gateway for people entering the city from Interstate 24 at Moccasin Bend. Now, he said, it's an eyesore. "It looks like a steel town from the Seventies," Woods said. He also disputed the idea the team would move out of Chattanooga. The team, which had been losing money, is profitable, Woods said. He credited operating partner Jason Freier, who Woods convinced to come into the ownership group based on his past performance in other cities. "Jason knows what he's doing," Woods said. "I brought Jason in as a partner to increase the fan experience." He also discounted criticism by some in Chattanooga of a future stadium, saying it's coming from people who are "misinformed." "I'd never move the team," he said. Woods said the existing stadium was built to last 20 years at a $9.5 million price tag. Now in its 19th year, AT&T Field wasn't designed or built to today's standards, he said. He said the current owners have put about $1 million into the facility in the last four years. Woods added that some of the same people against a new stadium are those who fought construction of the Tennessee Aquarium. "They're the same closed-minded people," he said. White said she has visited SunTrust Park, the home of the Atlanta Braves, and seen the new development around it. If the city and county decide to move ahead, River City will conduct a long-range planning process for the existing stadium tract, she said. "We'll see what we can do to get more life and animation," White said. Ultimately, the new stadium "boils down to a business plan," she said. "Can the Lookouts and U.S. Pipe owners create a deal to work with everybody?" White asked. Contact staff writer Mike Pare at mpare@timesfreepress.com or 423-757-6318. Follow him on Twitter @MikePareTFP.